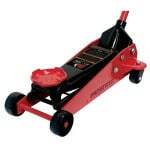 Are you a do-it-yourself car owner? Do you enjoy performing routine maintenance and oil changes on your vehicle? Well, at some point time you will have to lift your car off the ground. 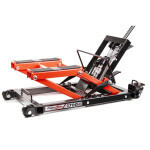 If you don’t own an in-garage hydraulic system, you will either need a jack or a ramp to raise your vehicle for a better look at things underneath. One of the most common DIY tasks that any vehicle owner can do is change their own oil. It’s something that simply has to be done on a regular basis. Whether you’re own of those who changes oil every 3,000 miles because that’s what you’ve been taught, or you follow the manufacturer’s recommendation of 5,000, 7,000, or even 10,000 miles, an oil change is a necessity. No matter if you’ve done your own oil change before or it’s your first time doing so, you want to be sure you do it right. So the first question is… should you use vehicle ramps or jack stands to lift your car off the ground for an oil change? This often sparks a hot debate in the car world on which (ramp or jack stand) is the best option to lift your vehicle. Some people prefer using jacks while others stick with ramps. So which method is the best? Almost everyone who owns a car knows how to use a ramp. 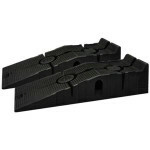 The simplicity of ramps and their ease of use are their greatest strength when it comes to vehicle maintenance. You just need to set them down, drive up the slope, pop on the parking brake and ensure you set the required wheel chocks. After this, you’re pretty much ready to go. 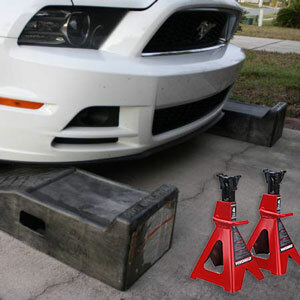 Another thing you need to consider when choosing between jack stands and car ramps is your budget. 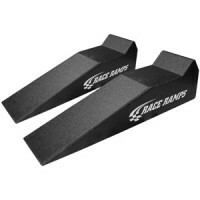 Car ramps are usually more affordable as compared to jacks and jack stands. Everything has to have a disadvantage, right? Car ramps are no exception. When positioned on a slippery surface (whether on slick concrete or an oil stained driveway) or on ground with a lot of debris, the ramps can slide when you are driving onto them. Also, trying to use the most common type of car ramps (made of high strength polymer) on gravel or pebbles can prove to be disastrous. Ramps are made to be used on hard, smooth surfaces so the weight of the vehicle is distributed on the bottom of the ramp. If used on uneven ground, the ramp can actually fail. Not something you want happening when you’re under your vehicle. Also, if you have limited space, ramps might be difficult to use because you need to move back and forth when using them. 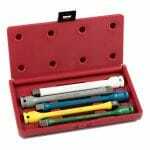 Apart from these, they are very safe and straightforward to use. Some extra low profile cars may also have an issue getting the front lip over some ramps without scraping but there are longer low profile ramps made just for this problem. 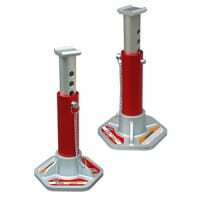 When compared to ramps, you may find that a jack and jack stands are more complicated to use. However, if you know your vehicle lift-point locations, you only require a couple of steps to set them up. 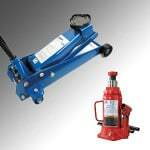 To begin using them, you need to pop on your parking brake and chock the wheels that will be left on the ground. Then, jack up the car with a good 2-ton or 3-ton hydraulic jack, put the jack stands under the proper lift points and slowly lower the jack until the jack fully supports your car. Why then should you use jack stands over a car ramp? Well, jacks and stands excel in cramped spaces. You don’t need to move your car when lifting it up. When using a ramp, back and forth movement is required when using them. You either need to back up to place ramps or drive forward onto them to raise your vehicle. Another area where jack stands excel is that they welcome greater flexibility in your work environment. This, of course, depends on the kind of work you’re doing. When working on your brakes, you obviously can’t take the wheel off if it’s sitting on top of a car ramp. 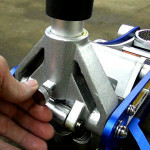 Here’s where jack stands are the only option (short of having a complete lift setup in your garage). Finally, the disadvantage of jacks? The biggest is probably time. It’s much easier to simply drive onto a set of ramps than jack up one side, position the stand correctly, lower the side, and repeat for the other side of the car. Another negative is that stands need to be placed in the correct spots to be used safely and they don’t have a large margin of error. If you haven’t set them correctly or they’re not positioned under the appropriate lift points, one accidental shove and your car could come crashing down. As far as oil changes go, car ramps are the winner here. Visit any car enthusiast forum such as www.bimmerforums.com or www.clubwrx.net and you’ll undoubtedly get the same answer. However, for other routine maintenance, the decision is a bit more complicated. 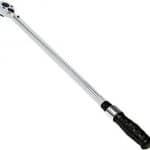 The safety factor and simplicity of these products make it very easy for do-it-yourself car owners to use. Either way, beginners should familiarize themselves with proper us of both ramps and jack stands and they’ll be prepared for any situation. TIP: No matter which method you use to lift up your car for an oil change, do yourself a favor and get a good mechanics creeper to make things even easier. Be sure to check out our mechanics creeper recommendations.